Something that I've noticed for a long time, but have had difficulty articulating properly to people, has been what I've seen as the chronic undervaluing of paid search and paid social channels within Google Analytics... which has led to poor decision making regarding these channels. It's not your fault that you've been selling CPC short, the reporting you see in Analytics can easily lead you to that conclusion. 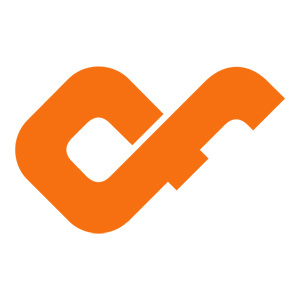 With this post I hope to spread the Word: take a deeper look into how these channels fit within your funnel, don't stop at the aggregate channel report for answers! Google Analytics utilizes the Last Non-Direct Click Attribution Model; what this means is that Analytics looks at the User's last interaction with the website and assigns the goal conversion value to that last session (as long as not Direct). The user came in from an Email? Then the Email channel gets that revenue assigned to it. Their last visit originated from a social media post? Then the goal completion gets assigned to the Social Media channel. It doesn't matter how many times they came to the site before that, or how they arrived the first, second or third time... if the fourth time was the one that converted, the entire value of that conversion goes to that last session. This also relates to other channels, but CPC and paid methods seem to bear the brunt of the criticism. Lets say you're looking at a lovely dashboard you've created within Analytics to look at your CPC channel. This dashboard will have items like your Total Spend, and Sessions, but also I'm sure Goal Completions, Conversion Rate, and Cost Per Conversion. All data points that a good dashboard should have. But it's only looking at the data from the Last Interaction Attribution Model. Think about it: a user comes to your site, perhaps for the first time, from paid search. They sign up for your email list, or follow you on Facebook as a result. No sales came in that session. A few days later, acting on an email offer that you sent, they make a purchase. But who gets the credit? Email. Email gets the credit, not the Paid Search. Your paid search report will look like it's not generating the sales, whereas your email report will look like it's getting all the sales. This might be seen as reason to cut back on your paid search, which would be the wrong approach, since that user first discovered your site through a paid search link click; cutting back on paid search might cut off that funnel of new, potentially high-value visitors. But you can't readily see the value that the CPC contributed to that user's purchase, since the value assigned to the CPC for that user is 0. What this report is showing you is Users who came into the site through one or more channels, and which channels those were and in what order. 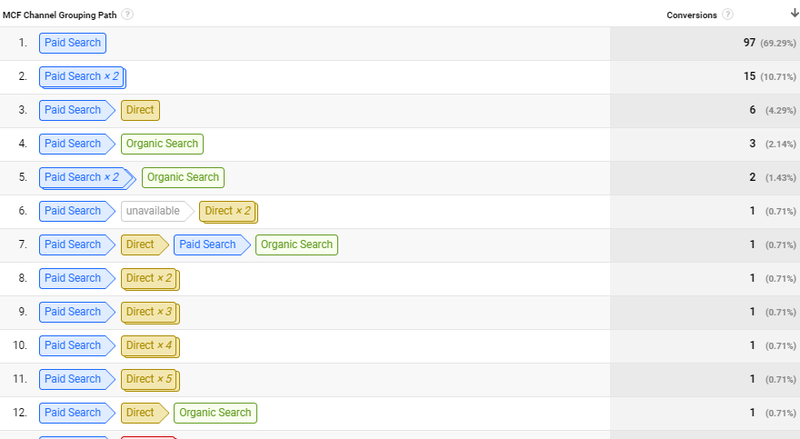 So for example, line 7 has a a user that came in originally through paid search, then direct, then paid search again, and then organic search before they completed a goal. 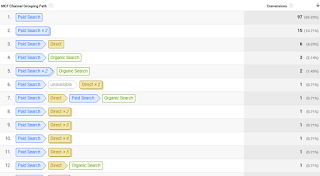 In this example the organic search would be credited with the win, even though CPC played a part. This is where a good segment in your Analytics becomes very handy. What we want to do is create a conditional segment that, instead of looking at information by the Session, will look at the User in their entirety that included Sessions matching the channel we want to evaluate. In this example I created a segment called "Users including Paid Methods" which is filtering Users (not Sessions) which had sessions matching the Paid Search and Paid Social channels, as well as any matching the Medium of CPC. So how much of an effect does this have? Good question! 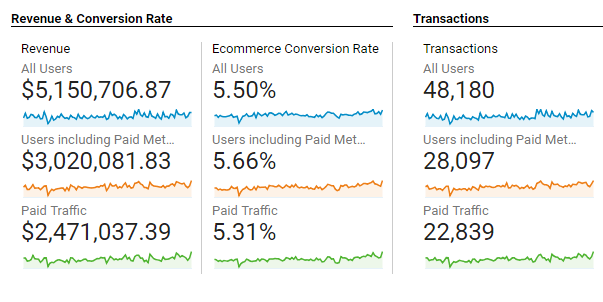 Looking at the Analytics reports for one of my e-commerce clients, I looked at Revenue across three segments: All Users, Paid Traffic (a standard segment), and our new segment "Users including Paid Methods". What we see is that Paid Traffic accounts for ~48% of the revenue, whereas our new segment of Users including Paid Methods accounts for ~59% of the revenue. Including previous sessions, not just Last Interaction, boosted the measurable impact of paid methods by 11% of the total revenue generated, or 22% addition in funnel contributed value. 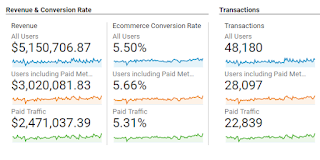 With so much of Analytics, it is important to ask yourself exactly what a given metric means, and whether that metric is representative of the question that you're asking of it. When looking and evaluating the return on investment of a digital marketing spend like CPC, you want to know the return from those costs... but as demonstrated above it is important to understand the data as a Session vs the impact on a User. Ask more questions and work to understand exactly what you're looking at when you're seeking an answer.